Home computer Tricks Windows how to clean and speed up windows 10 with Microsoft's Refresh tool? how to clean and speed up windows 10 with Microsoft's Refresh tool? This means using a software from Microsoft. Named RefreshWindowsTool, it will find a blank computer where all third-party applications are deleted. 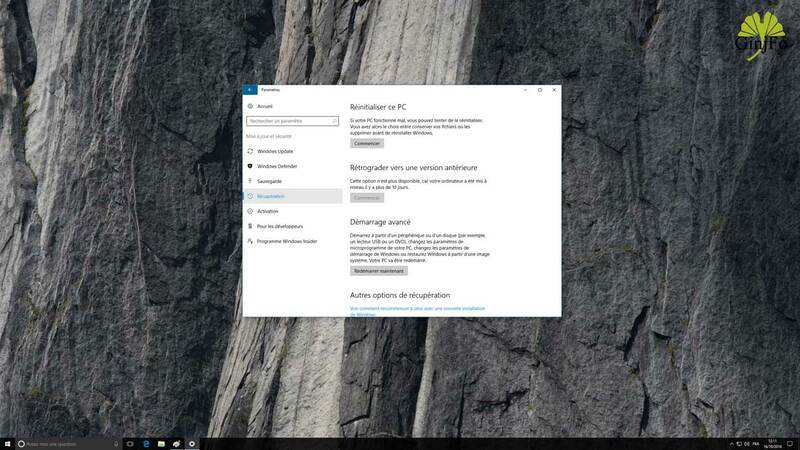 It also allows you to upgrade to the latest version of Windows 10. Buying a computer with a Windows operating system may be a problem. It is quite rare that the operating system is "clean" in the sense that no third party application is present. Often a lot of thing is installed. While some may be useful others are intrusive and resource-intensive. 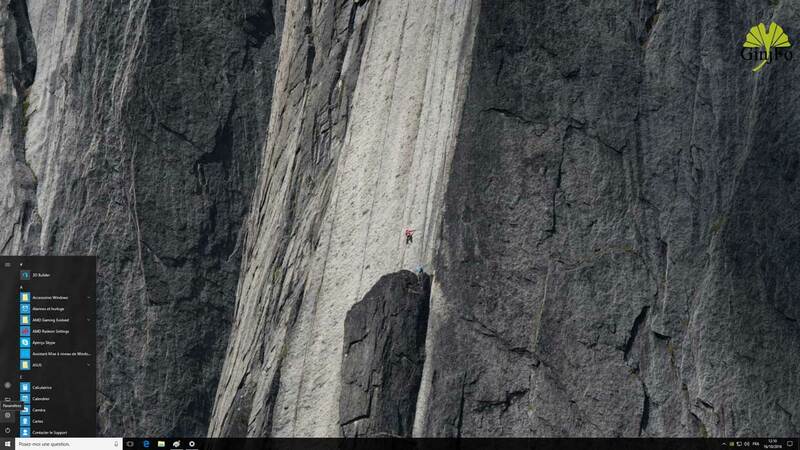 In the end all this little world participates in slowing the performance of the PC. You probably noticed it. A brand new Windows computer is never "empty" application. This context is not conducive to maximum performance. It is possible to do a manual cleaning by trying to uninstall these small programs. This takes time and sometimes knowledge because removing entries in the registry is sometimes necessary. 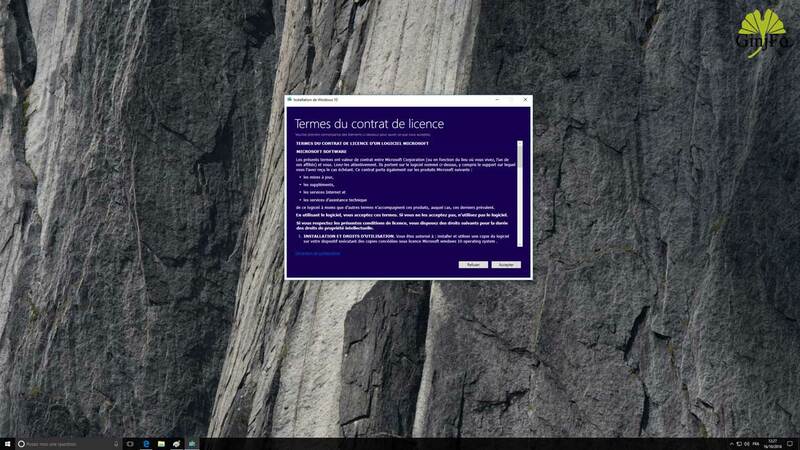 If the computer has Windows 10, there is a simple way to remove all this content. It allows to reset the machine with an operating system washed of anything that is not "native". 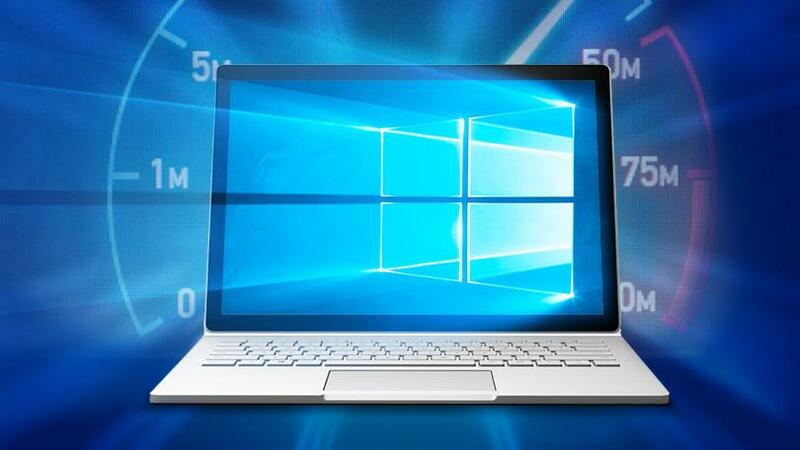 There will only be the original applications shipped with Windows 10, that's all. In addition, it allows to move to the latest version of the operating system. You must go to the Start menu and then Settings. 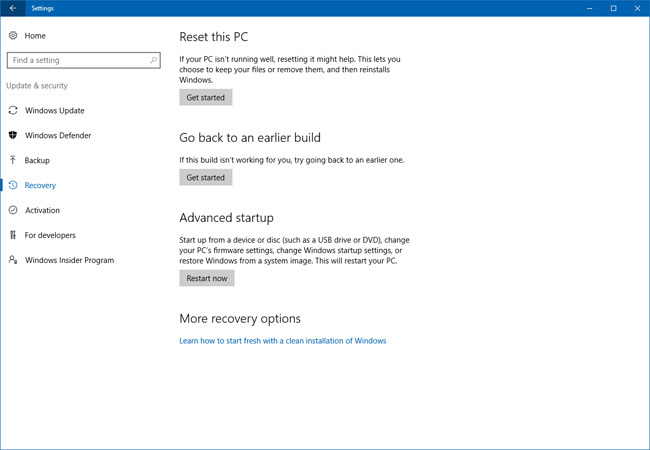 In the new window, you must open "Update and security" and finally go to the "Recovery" tab. There are several possibilities here. Our choice is to " reset to zero with a new installation of Windows ". This is a link to the download of the tool in question. We advise you to do this at the beginning of the use of the PC and not after the installation of its own software as Microsoft notes.
" 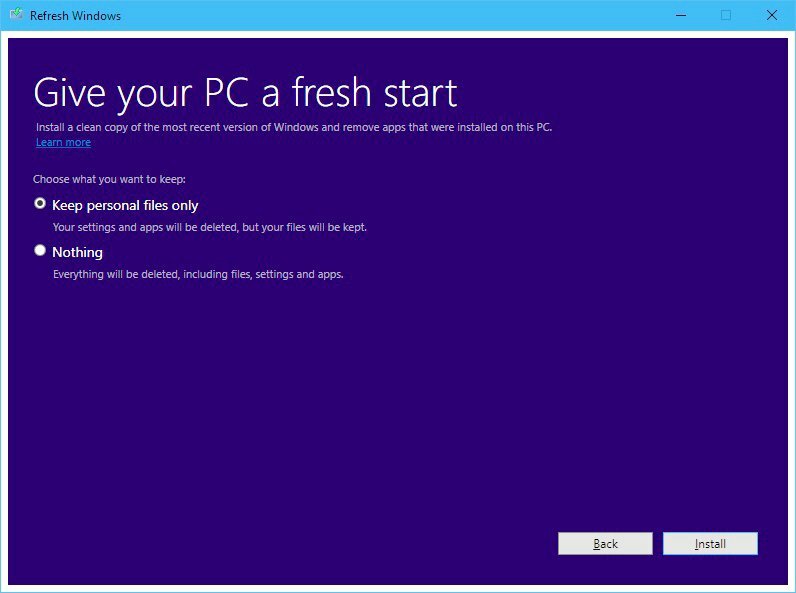 Use this tool to install a new copy of the latest version of Windows 10 Family or Windows 10 Professional, and to remove any applications that you have installed or that are preinstalled on your PC. You have the option to keep your personal files. Using this tool will remove all applications that are not included with Windows, including some Microsoft applications, such as Office. This also removes most of the applications installed by your PC manufacturer, such as drivers, support applications, or those from this manufacturer. You will not be able to recover deleted applications. You will need to reinstall them manually if you want to keep them. " Before proceeding, make sure you have at least 4 GB of storage space. Once downloaded, this tool is available in the "Download" directory (with the Microsoft Edge browser). All that remains is to execute it. 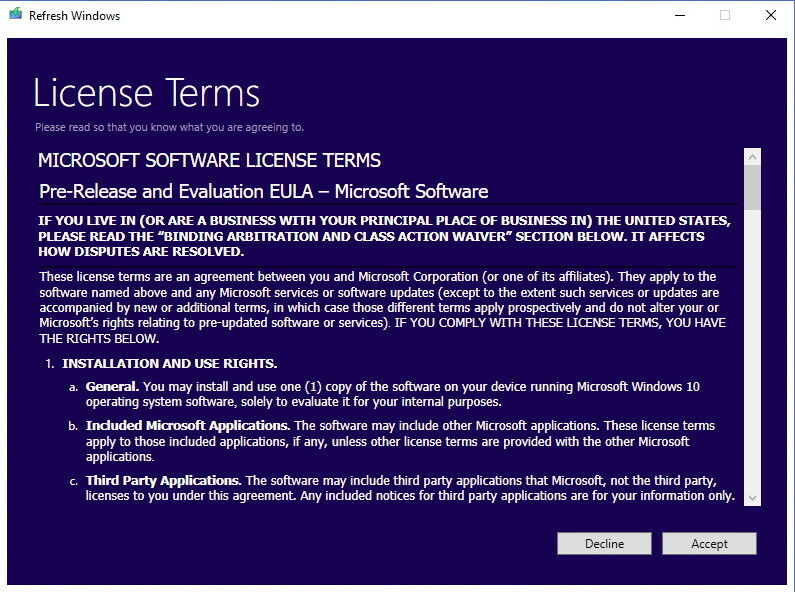 The giant asks you to accept the terms of the license agreement. The second step is important because it is here that you must specify whether or not you want to keep only your personal files. 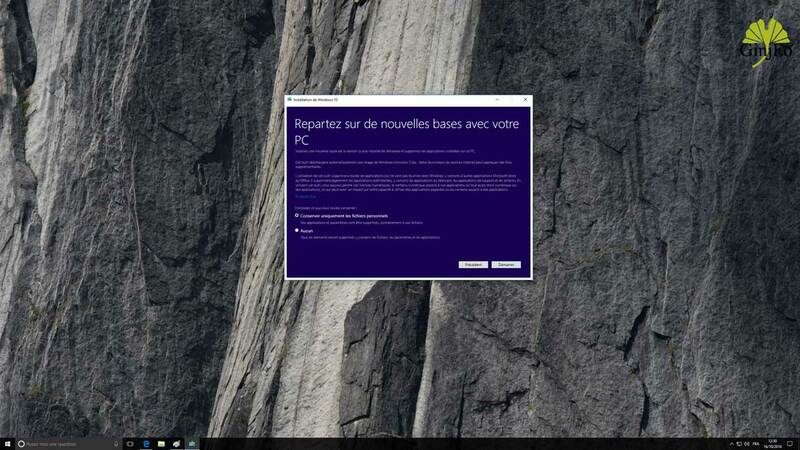 A click on the Start button then starts the recovery of the files needed to install the latest version of Windows 10. The process is automatic. All that remains is to wait and then follow a few simple steps for the setting up of the OS. When opening it you should see a brand new system and especially cleaned pre-installed applications not "Windowsian".